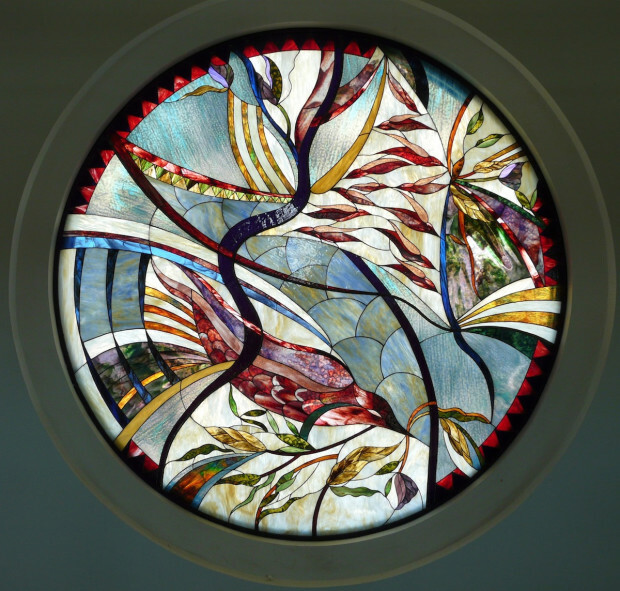 This large commission of stained glass windows was executed over several years. During the initial design phase, I was approached by the Parish to collaborate with the architects and the Church committee. 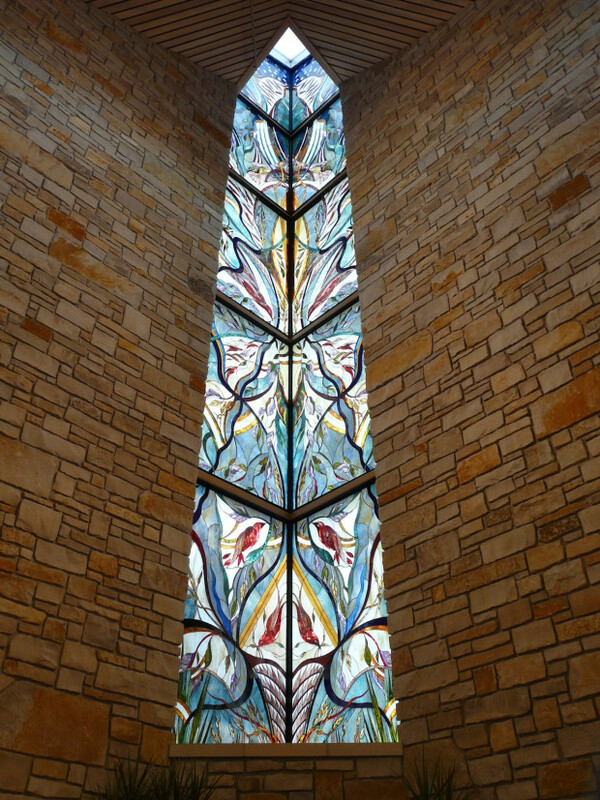 The first phase commission encompassed three large windows behind the altar, 22’x 6’, 42’x 8’, 22’x 6’, and a rose window on the opposite wall, 8’ in diameter. Upon completion of those windows, I was asked to create two windows on either side of the altar, each 10’x 5’, and four windows on the side walls, each 1’x 9’. A third phase is in discussion. 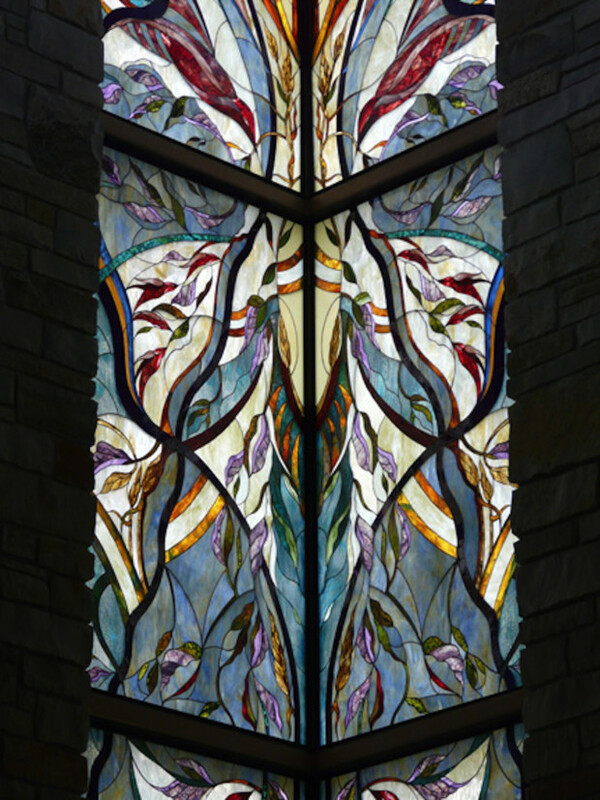 My goal was to create a stained glass tapestry that wove together a sense of place and a sense of spirituality. I wanted to reflect both a personal and universal narrative that would vary over time, much as the windows would vary as the light moved through them during the day. 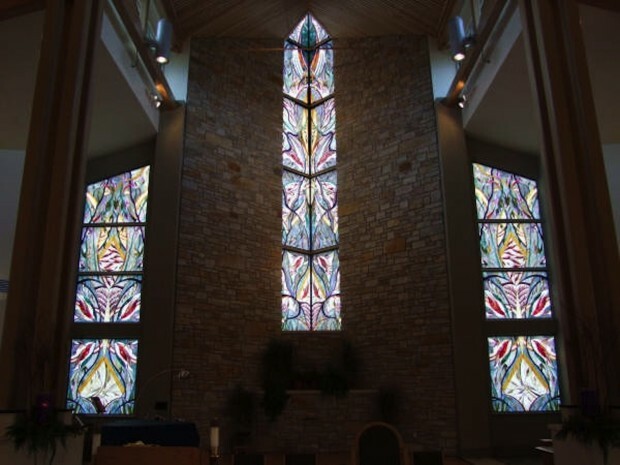 Understanding the committee’s goals was paramount to creating a work that would meet the challenges of a diverse congregation, a Priest who had very definite ideas for the outcome, and an out of state architectural firm. 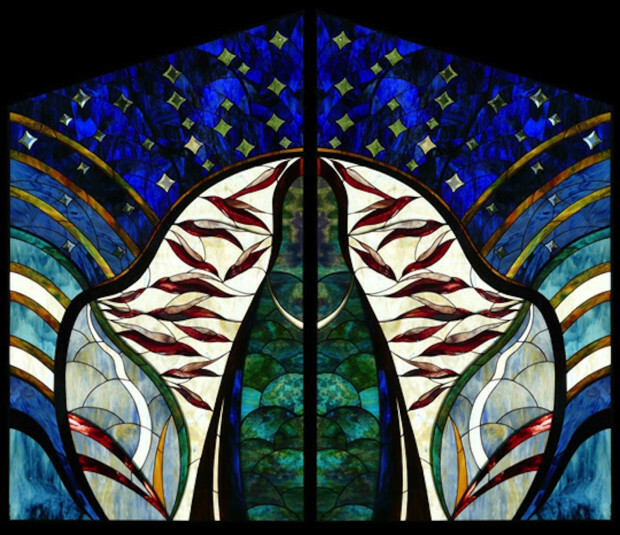 Although the committee was aware of my other stylistic liturgical commissions, we did clarify that my work, while narrative, would not mirror historical realistic Church windows. We discussed the importance of their visual story. Over and over, the words, “wheat” and “wind” surfaced to the people of this farming community. North Central Montana is windy and much of the time, the vast acres of native wheat fields are swayed sideways in its path. The committee wanted this sense of place to be reflected in the work and so it was my task to integrate my aesthetic with the spirituality of the setting in a meaningful way. The next stage of the commission was presenting proposals to the committee. I rendered three sets of scaled drawings and over the next month, finalized one. That drawing was taken to the architects, the construction firm and the glass company to make sure that the sizes and weight of the glass panels would meet code. Because of the enormity of this project, and the need for completion in a timely manner, I needed more assistants than I had had in the past. Together, with my long time collaborator, Lippert Studio, logistics of the project were decided. I hired assistants, chose the kinds of glass to be used, and put together a timeline. It was essential that I see the glass and not just look at samples so I flew to three difference companies to pick out the sheets. My designer husband built the glass tables allowing for several panels to be viewed at once. I had my drawings enlarged to 4’x 8’ panel size, and clarified with the builders that the measurements would fit within a 1/8 “ of the openings. We set up work areas in my large studio, and when crates arrived, I began. 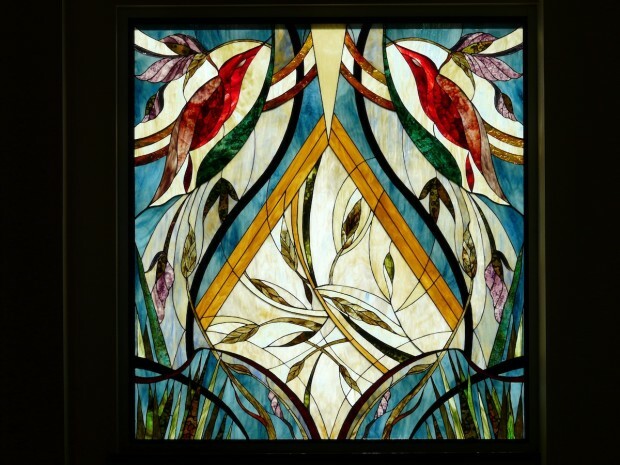 Rising from the base of the windows, native wheat is whipped in the prairie wind and the earthly elements beckon the eye upward, becoming undulating vines, flowers and birds. Purple vines branch into a chalice, with the host rising above. Upward crowned angels unfold into the cross lifting the Virgin through the clouds into the starry sky. The great beauty in working with glass is that the artist alone cannot complete the vision. It takes light to bring the over 12,000 pieces to life and create a work that becomes more than the sum of its parts.